This unit features a Summerset grill, fridge and storage. In order to install the hood vent, we had to block in the window and run electric. 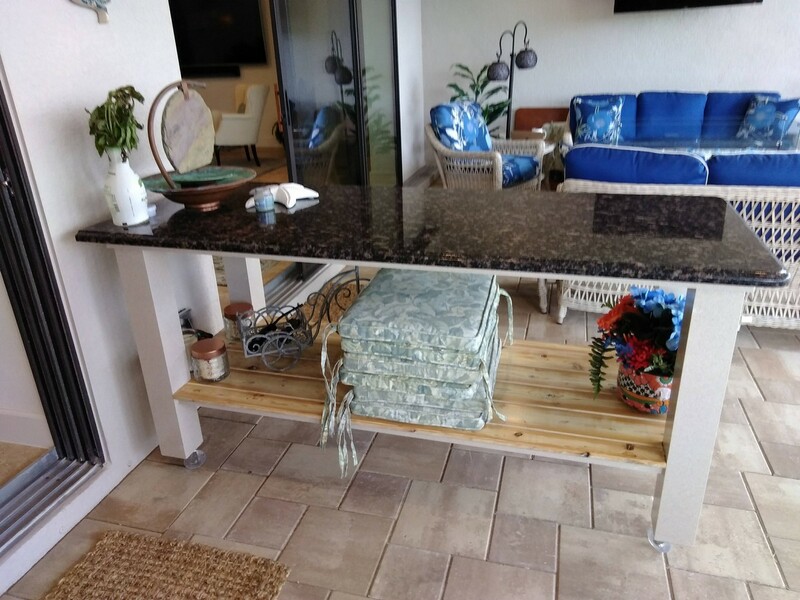 In addition to designing and installing the kitchen, we built a custom table on wheels for the customer’s outdoor living area, complete with a cedar floor and granite top. We had it powder coated to match their patio furniture. 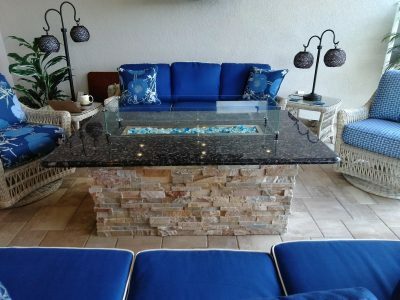 We also built them a beautiful custom fire table with stone face and granite top. 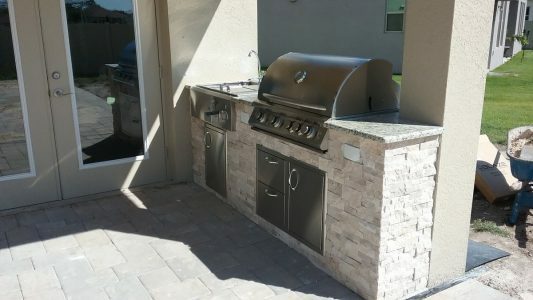 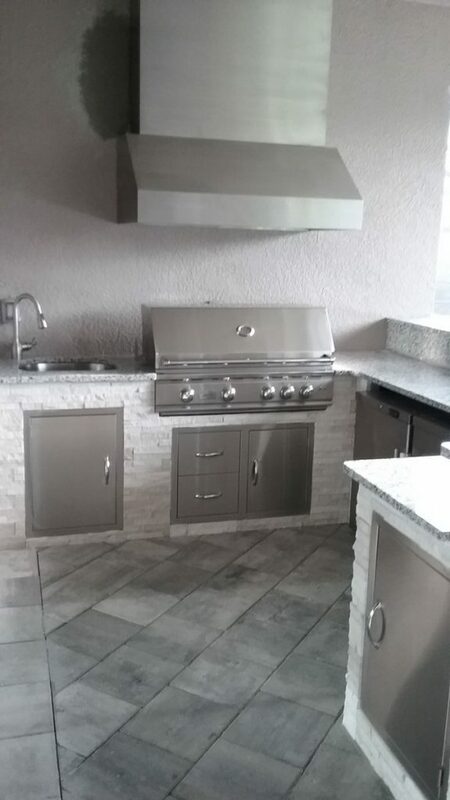 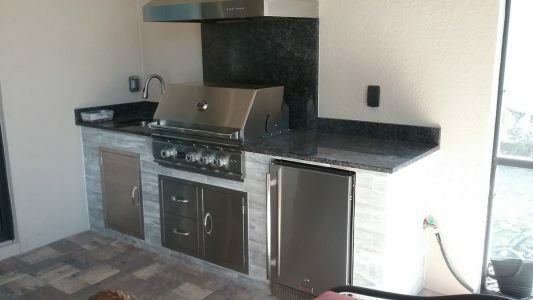 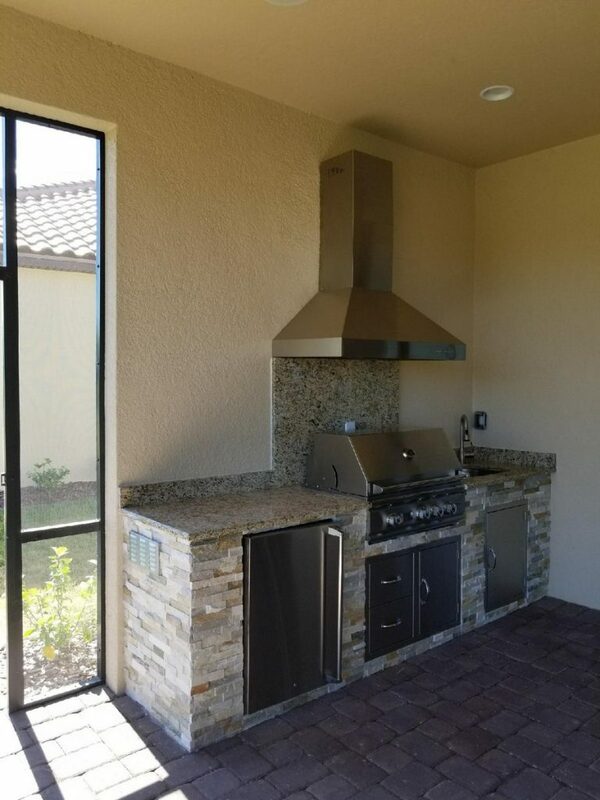 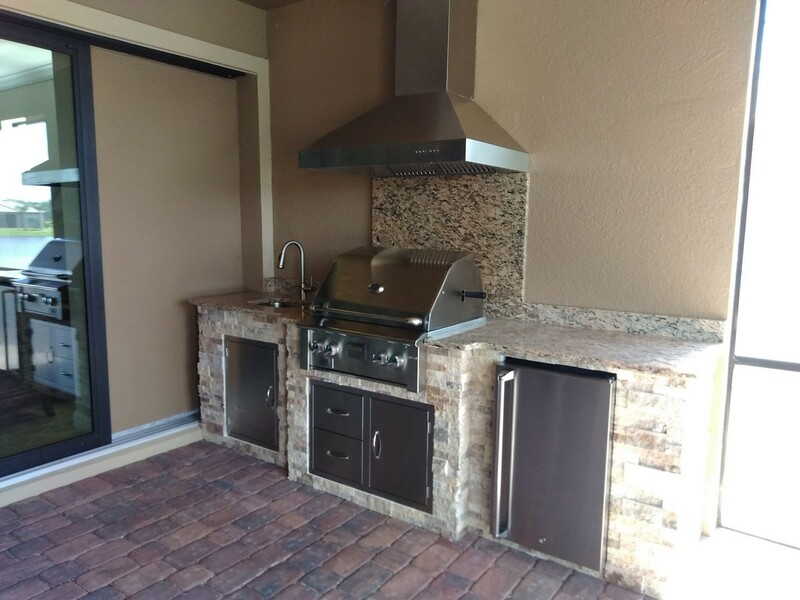 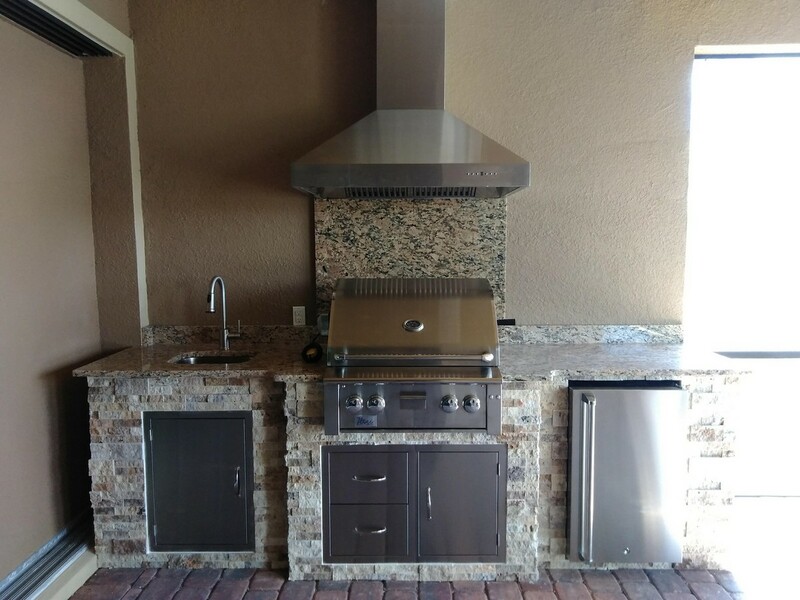 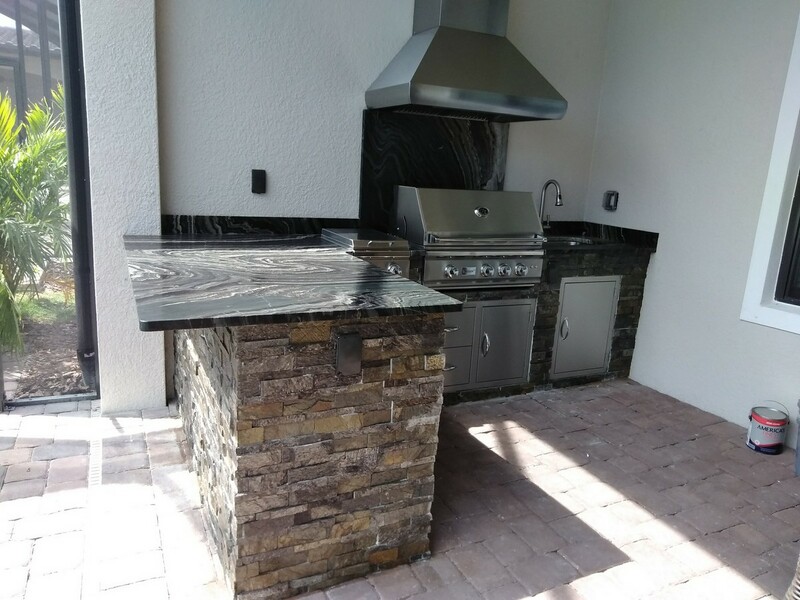 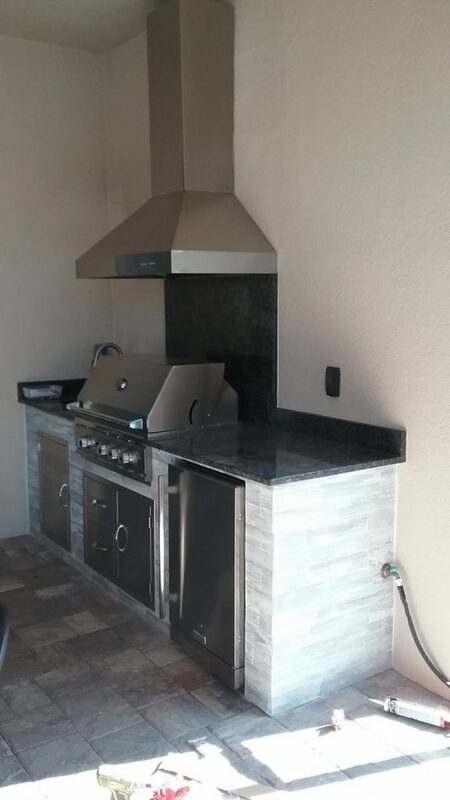 This outdoor barbecue area features level 3 granite countertops and a Summerset grill. We blocked in a window and ran new electric to accommodate our hood vent. 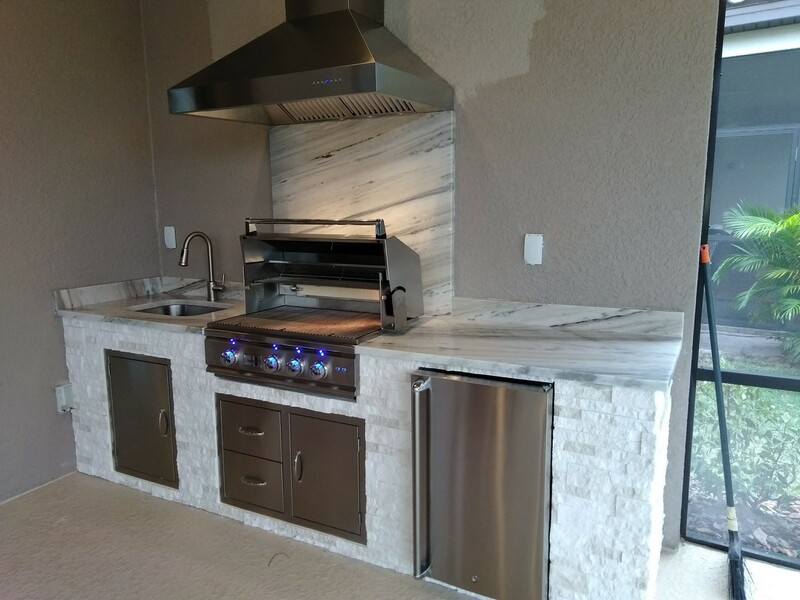 This kitchen has a Summerset Alturi grill, fridge and hood vent, set beautifully into a custom frame covered in a stone facade and complete with granite countertops and backsplash. 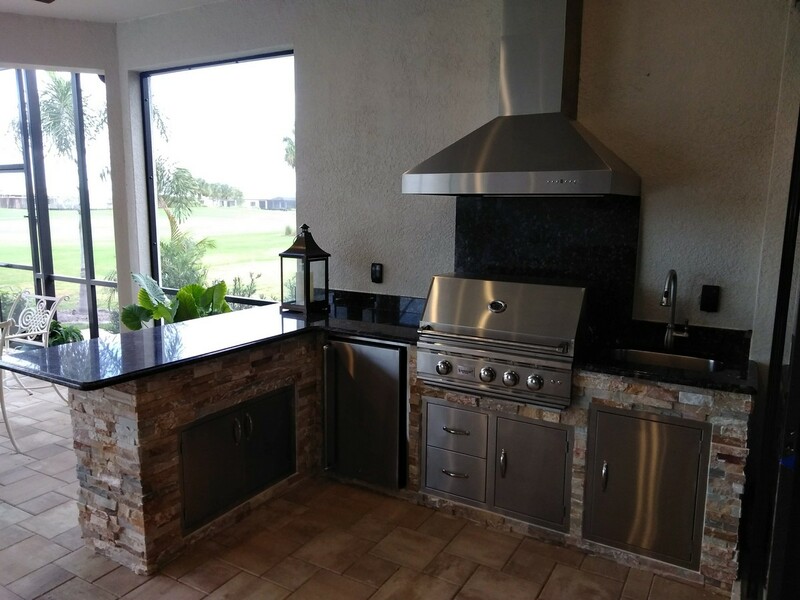 We turned a small corner of this Lakewood Ranch lanai into a premium outdoor grilling space with Summerset appliances and a beautiful, tiled wall accent. 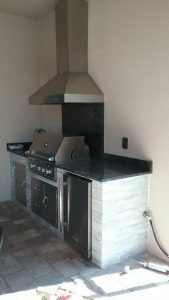 The project was not without its challenges: we had to (carefully) punch through the roof to run the exhaust. 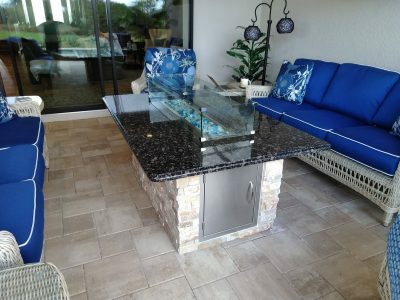 For this Lakewood Ranch lanai, we created a kitchen with an L-shaped design and beautiful, black and white marbled granite tops. 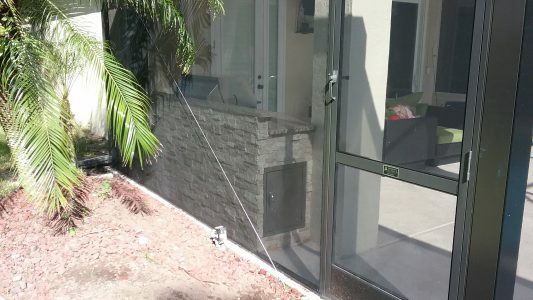 We blocked in an existing window to run out the exhaust. 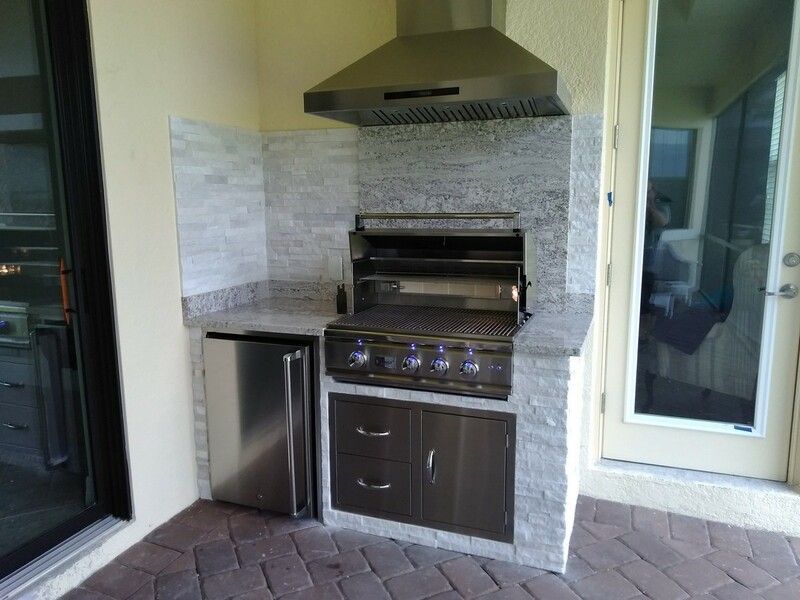 We created this little gem of an outdoor kitchen was in Esplanade Golf and Country Club at Lakewood Ranch. 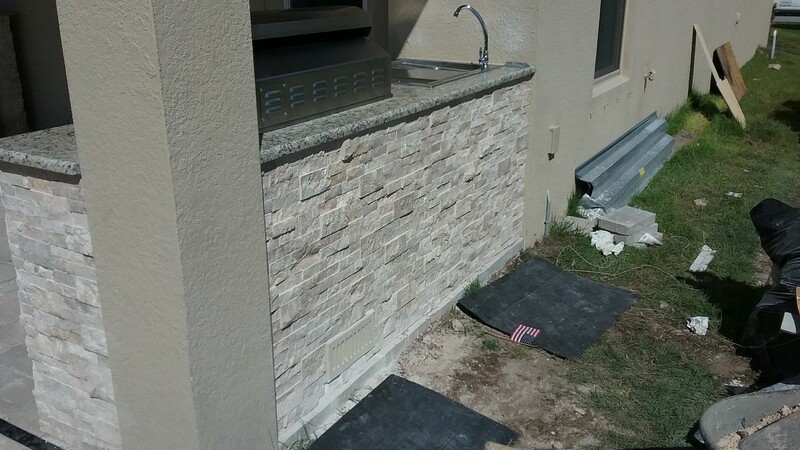 We had to block in and stucco the window above to accommodate our hood vent and run new electric for it. The appliances include a Summerset TRL grill with Summerset appliances and upgraded door sleeve. These homeowners in Esplanade Golf and Country Club at Lakewood Ranch selected a custom tiled facade in beachy, driftwood colors. This kitchen also required some custom integrations. In order to accommodate the hood vent, we had to block in and stucco a window. 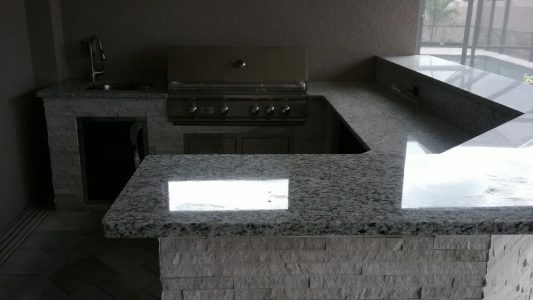 The kitchen required us to move outlets in the block as well, and we even ran a spicket out the side for the customer. 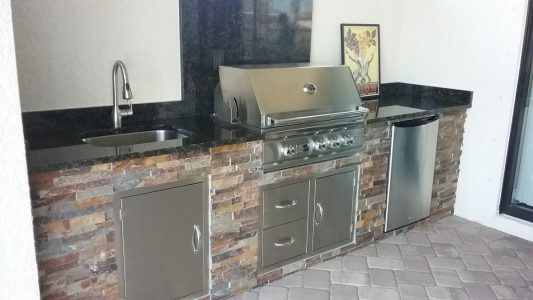 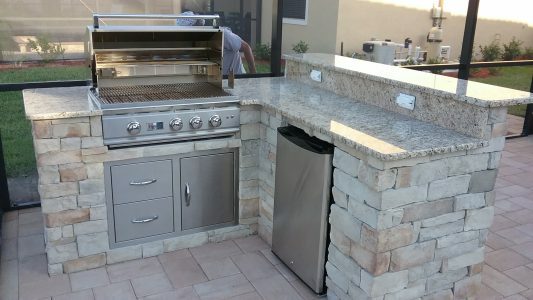 A Summerset Grill, sink, refrigerator, and storage/access doors/drawers were the appliances of choice for this upscale barbecue area in Lakewood Ranch Country Club East. 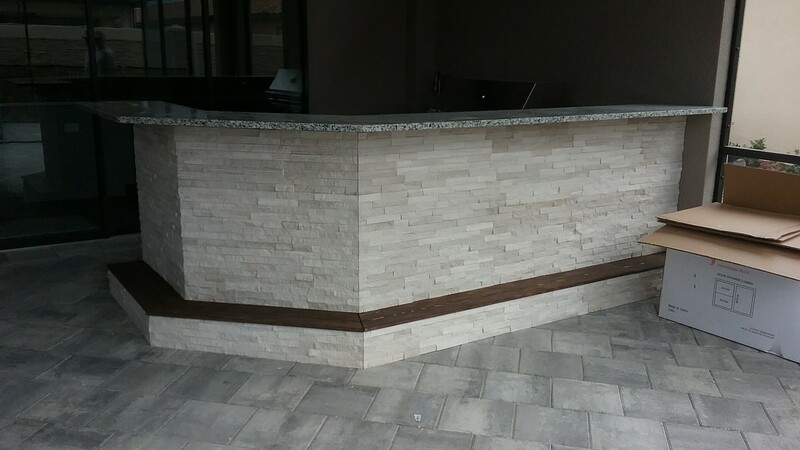 These clients selected a rich earth-toned stone facade and dark granite counter tops with backsplash. 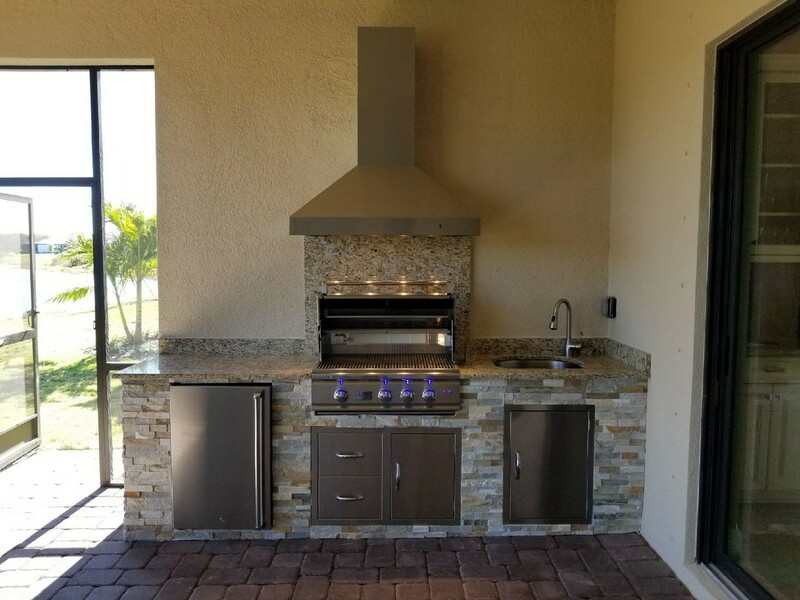 We created an outdoor kitchen and entertaining area, complete with wraparound counters with a raised bar and custom cedar foot rests. We installed not one, but two outdoor fridges and a Summerset TRL 38″ grill. Additionally, we had to block in the window just to accommodate the custom hood vent. 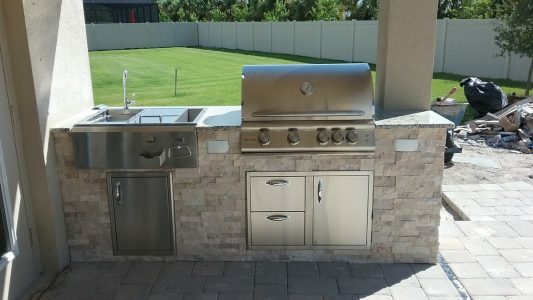 This Lakewood Ranch outdoor entertaining area features a Blaze grill, Blaze doors/drawers, a Lion entertainer’s bar sink. 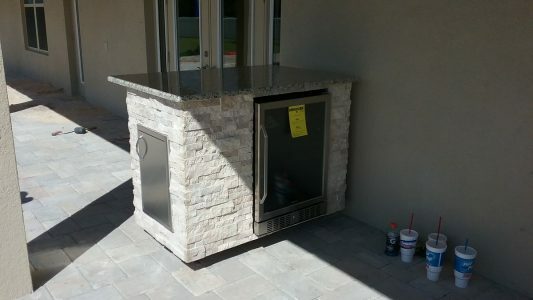 A custom refrigerator cabinet on wheels made it possible for us to efficiently use the space on either side of the double doors leading to the patio. 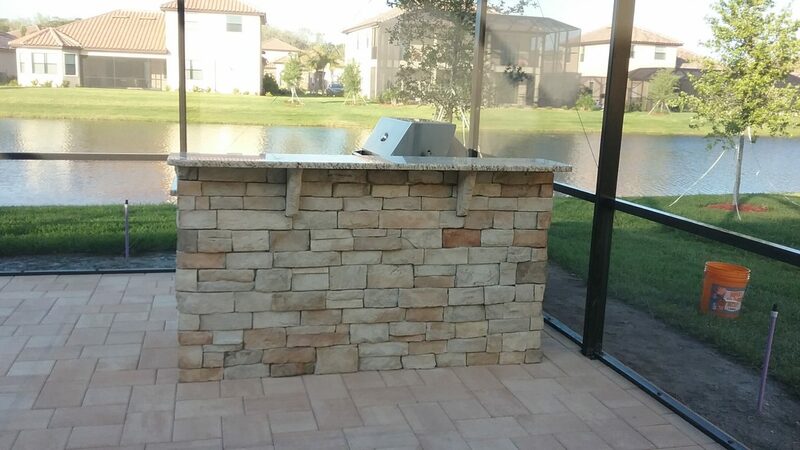 This Lakewood Ranch customer had to extend her lanai just so we could fit her dream kitchen. 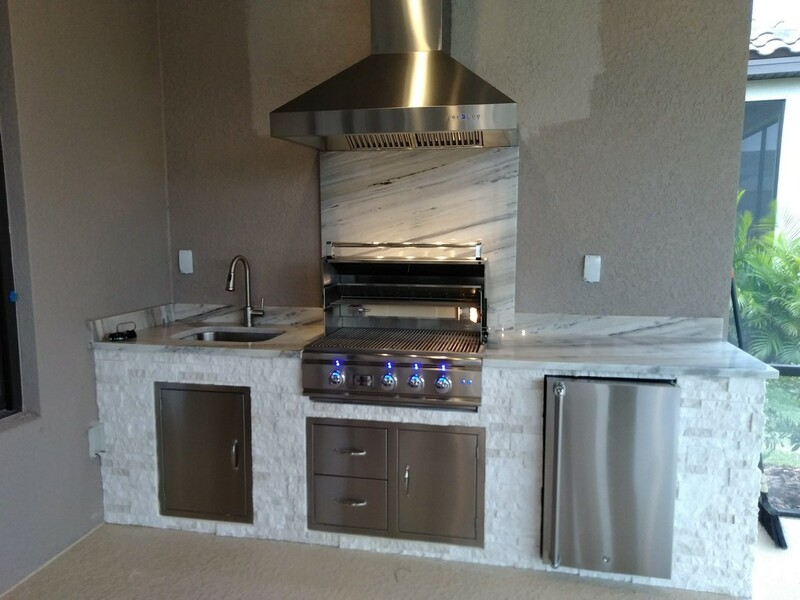 Because of the unit’s position against the screen, we also had to create a custom backsplash and shelf to accommodate electric. 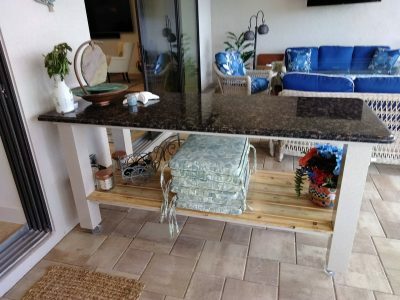 However, the finished product was worth all of the extra effort. 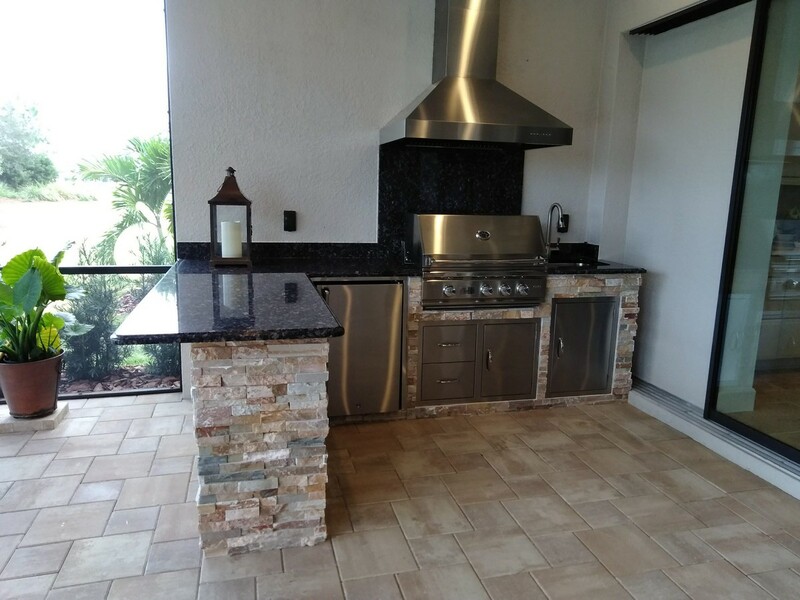 The finished kitchen blends so well with its surroundings, it looks like it has been there all along. 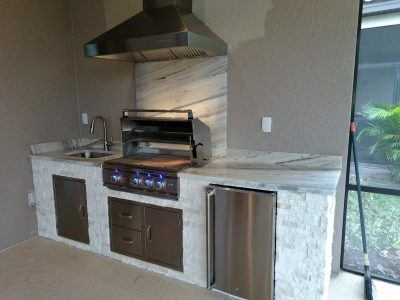 The design includes natural stone, granite counters, Summerset appliances, custom underside cabinetry with a side access. 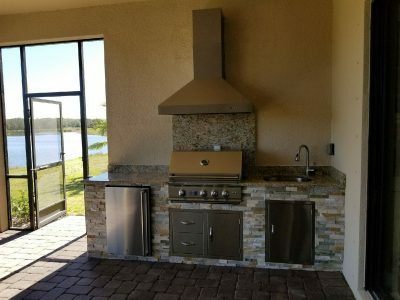 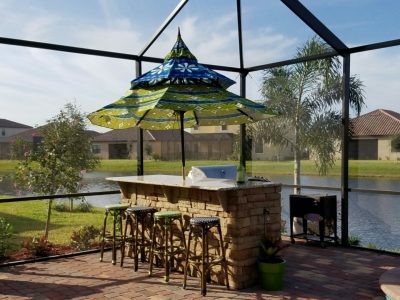 These Lakewood Ranch customers wanted an entertaining area where they could grill, drink wine, look out over the lake, and have easy access to the pool. We created a free-standing design surrounded in cast concrete stone. The granite countertops feature a raised bar area, supported by two stone corbels. 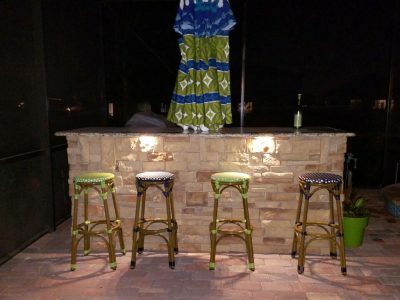 We even installed under-counter lights with a dimmer for extra ambiance after dark. 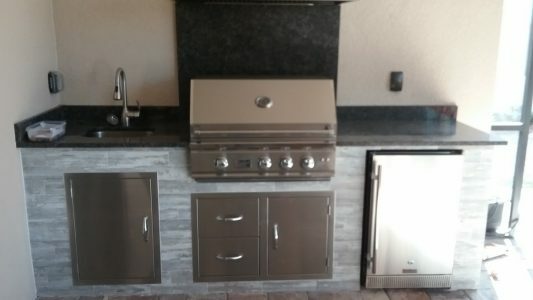 The appliances are all by Bull. 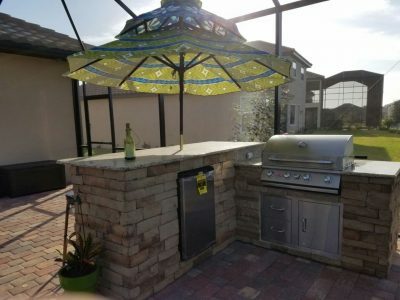 However, the centerpiece of this outdoor kitchen area is not the Bull Angus grill – it is the umbrella. We mounted the customer’s unique layered umbrella right through the granite countertops, where it acts as much as a conversation piece as a provider of shade. 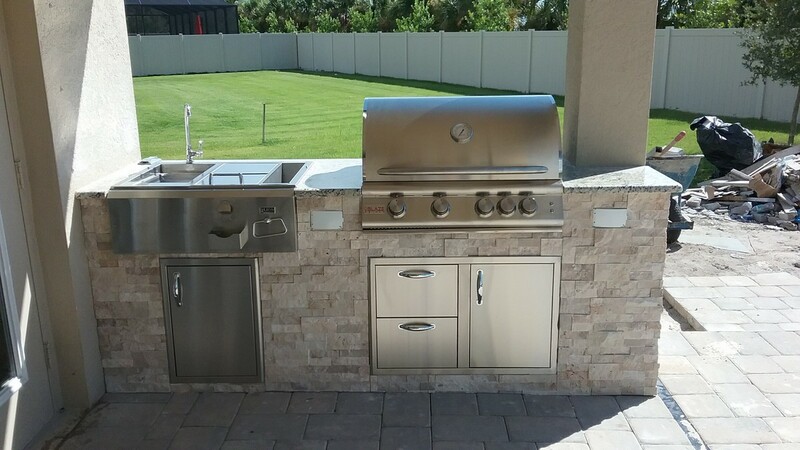 After we finished their neighbor’s outdoor kitchen in Lakewood Ranch, these homeowners called us and requested a similar design for their own home. They liked the free-standing L-shaped design, with cast concrete stone work all the way around. 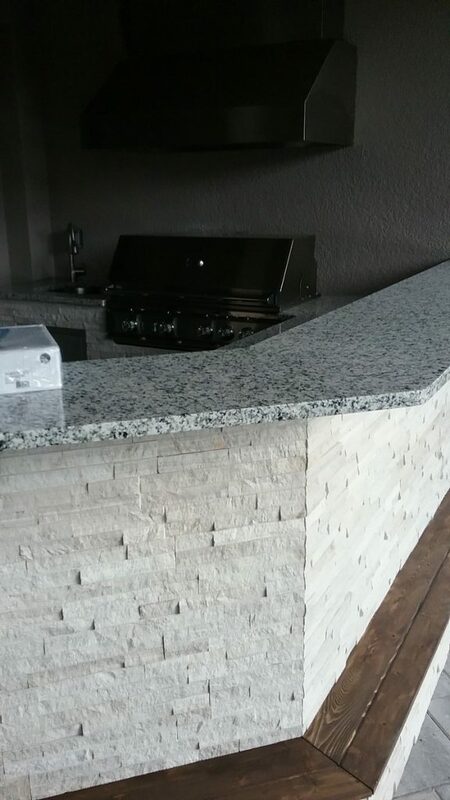 And they particularly admired the way that the raised, granite bar, supported by stone corbels, offers a perfect view of the lake. The appliances selected included a Summerset TRL 32” grill with drawers and doors beneath as well as a mini fridge. On this project, we were fortunate enough to be able to work with company designing the pool, who agreed to change their plan and move the pool over. 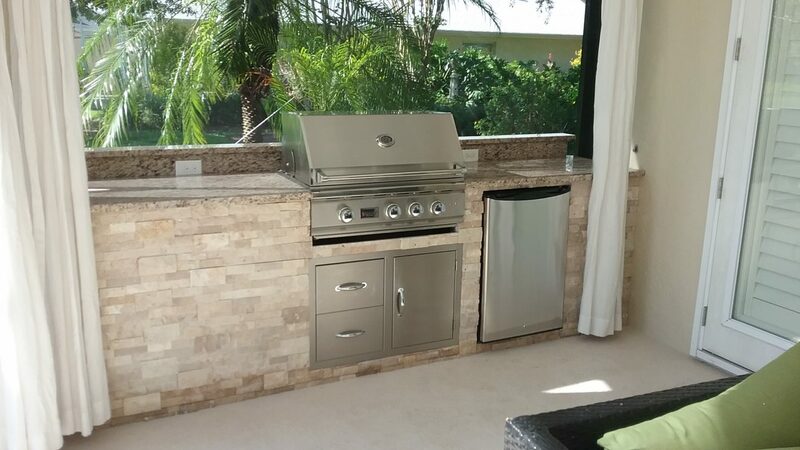 This alteration provided ample entertaining space around the outdoor kitchen area on the pool deck. 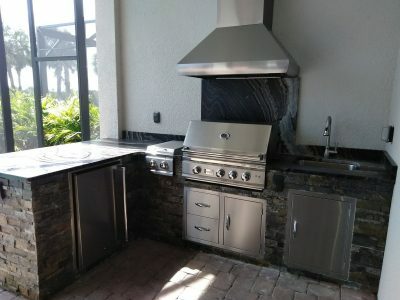 This customer requested a space for light entertaining that allowed for outdoor cooking without the mess (he told us that he was tired of cleaning grills). Our solution? 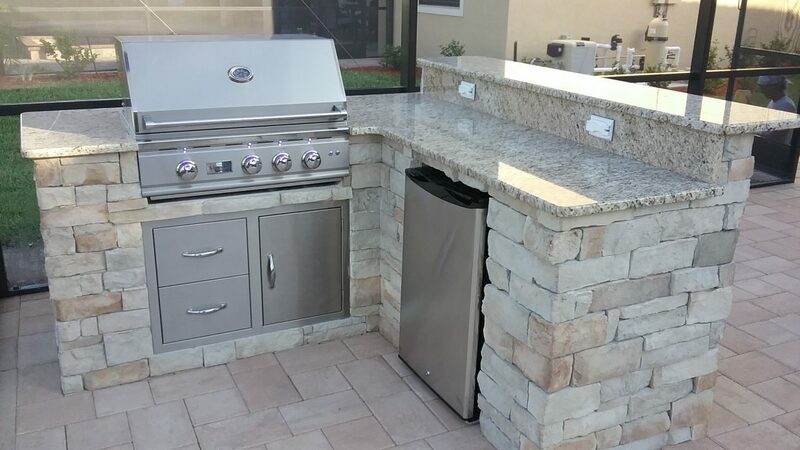 A Blaze double burner – perfect for small gatherings and easy to clean. All of the other accessories – the outdoor rated fridge, the sink, the double doors and door/drawer combo – are also Blaze products. 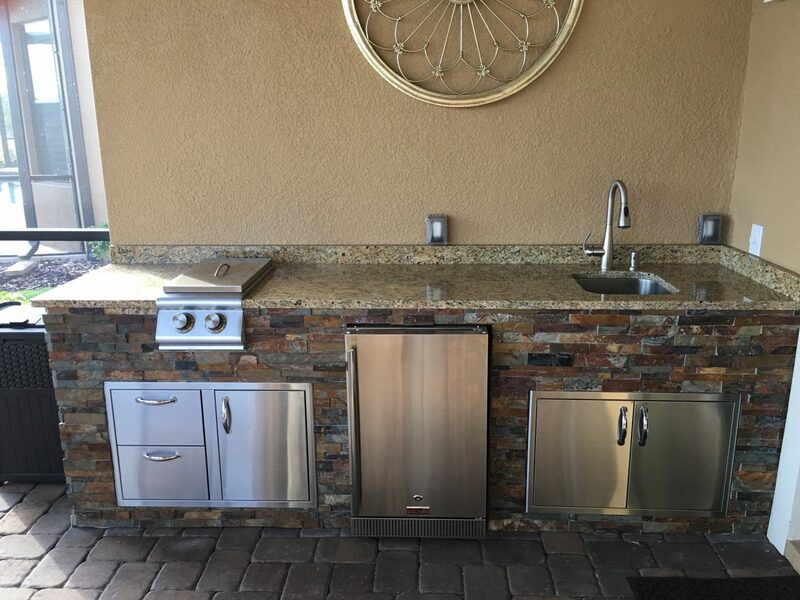 We also created custom pantries under the sink and the double burner. The real stone veneer was selected to match the pool, and granite countertops tie the space together.